We clean custom blinds, shades, draperies, valances and other fine fabrics using methods appropriate for the materials involved to safetly remove accumulated dust, allergens and other airborne grime. We are specialist in this niche market and do all of our own work either in your home or our shop. 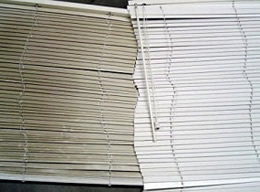 Cleaning your blinds and draperies periodically is a cost effective way to renew their colors and prevent the soils these on window air filters naturally attract from leaving dingy zones. Neglected spots from spills, splatters or bugs can also become permanent stains when left to back in the sun or set with time. A safe deep cleaning of your window decor typically costs 5-20% of what it would to replace it. If it is worth keeping, it is worth cleaning! Don't procrastinate on maintenance cleaning or repairs only to find yourself prematurely paying far more for replacements. You invested a lot of money in nice custom window treatments, extend their lifespan and improve the air quality of your home or facility with periodic deep cleaning. We provide our clients with personalized professional services for their window treatments. We routinely clean specialty shades like Luminettes, Silhouettes and Vignettes as well as custom blinds whether minis, honeycombs, pleated shades, verticals, faux and real woods. 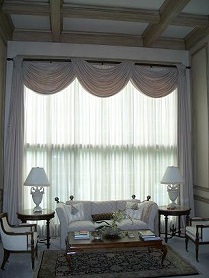 Draperies, valances (board mounted or otherwise) and other specialty fabrics, including upholstery, are also done. 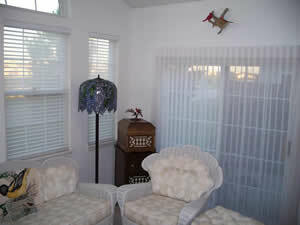 Cleaning custom blinds, shades, draperies and fine upholstery is our PRIMARY BUSINESS! Whether in our shop, in your home or in a place of business our experienced, certified professional employees can put their expertise to work for you. Call us today to discuss how our equipment and resources can be put to solving the needs of your project. Same Day Turn Around is Standard - Fast and Convenient - No bare windows! Appointments arranged to work with your schedule. On-Site Dry Cleaning Services - We can clean your drapes, valances fabric blinds, or fabric verticals where they are - when appropriate or requested. Blind Repairs are done in your home or at our shop.